Item Is This True Love? Description: I thought I was in love. But things don’t seem quite right. What is love? How should I feel? What should I expect? Here is a clear, description of love and how one can tell if he or she is experiencing it. There’s a discussion of what one must be and do in order to demonstrate love. Those with questions about their relationship will find especially interesting the section titled, “Where are you?” It describes five conditions in which married couples can find themselves; what they mean, and what to do about them. 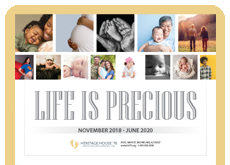 After seeing this at the pregnancy care center I felt this would be a very good brochure to display at our parish and give out at the festival. This is easy to understand and very useful to our clients who feel they are ready to look at their situation and relationship. "Is This True Love?" is a question many of our patients are asking deep down, but choose not to face. This brochure is a wonderful follow up after talking with ladies about their worth. The practical analysis tool inside helps readers to define the state of their relationship and determine if it is pointing toward marriage. I appreciate how the concept is shared that love is an active choice, and not merely a physical attraction. This brochure gives very specific detail on what to look for. We have had clients ask for additional brochures to give to others whom they may be concerned about. This is another item we have used outside of the center as well. 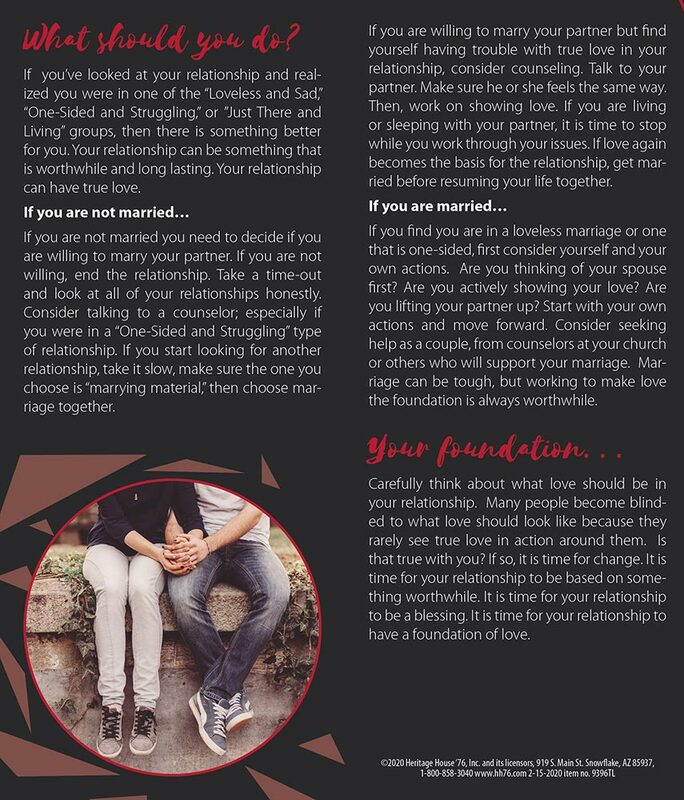 This brochure is helpful in showing clients that there are different types of relationships. It shows them what love should be, and often clients can recognize that their relationship has room for improvement. 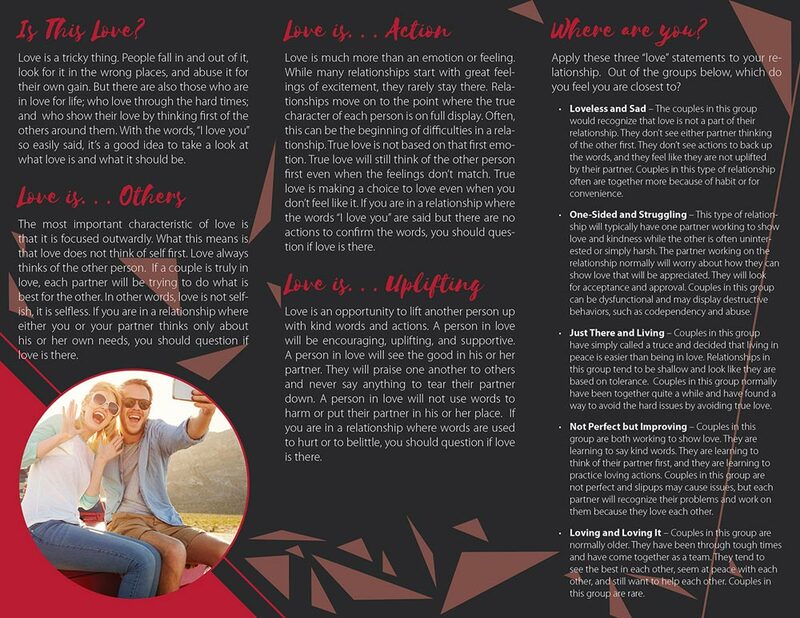 This brochure discusses the difference between what love is and different types of relationships and gives ideas for how to develop a love-filled relationship. Clients that may not have experience with a true love relationship can use this tool to guide them. This brochure is helpful. I include it in a packet of info for disbursement to clients that have just had a "negative" pregnancy test result as well as using it with abstinence presentations & sessions.